On Thursday, September 17, Chaminade High School’s student body and faculty gathered in the Activity-Athletic Center for a Mass to celebrate the Marianist Martyrs. At the start of Mass, members of C.R.O.S.S. processed into the AAC with banners, each bearing the name of one of the eight martyrs celebrated at the Mass. Seven Marianists were persecuted by religious authorities in Spain during the Spanish Civil War because of their devotion to Mary. The eighth martyr, Blessed Jakob Gapp, was persecuted by the Nazis during World War II. All of these men were willing to lay down their lives for their faith in God, just as Christ did for us when He died on the cross. 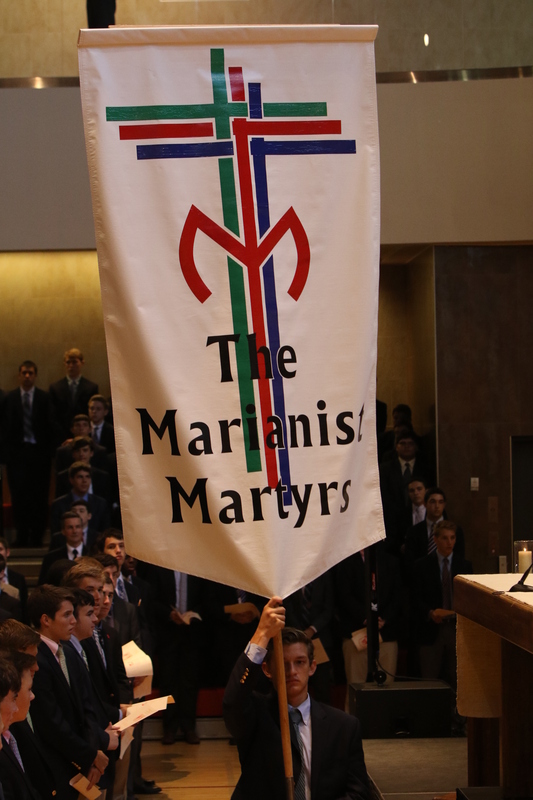 Members of CROSS carry banners with the names of the Marianist Martyrs into Mass in the Activity-Athletic Center. 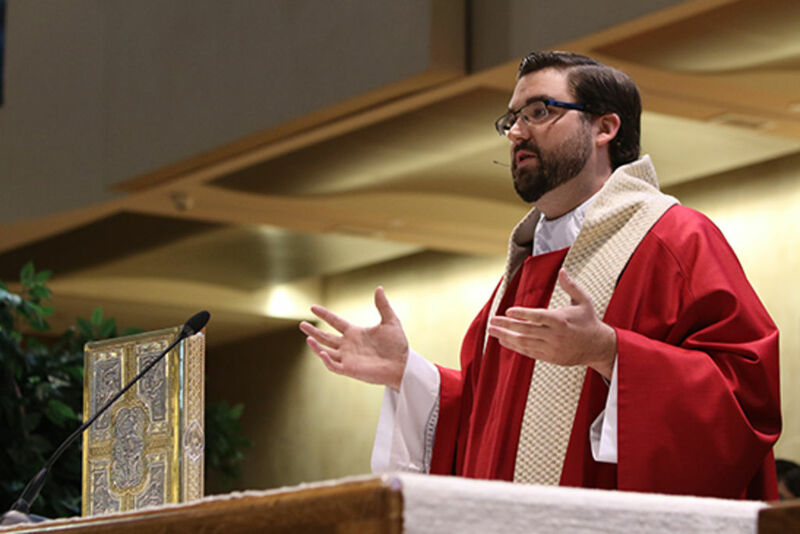 Father Andrew delivered a very inspiring and powerful homily about having total faith in God. He related a personal experience to the story of the Marianist Martyrs. Father Andrew explained how on October 19, 2006, he was at Shea Stadium for Game Seven of the National League Championship Series, which was the last time in recent history when the New York Mets were in the playoffs. He watched as the Mets lost the game in excruciating fashion, ending their season before they could reach the World Series. Father Andrew Garnett ’06 delivers his homily to the Chaminade student body. Even as the Mets and their fans experienced the lowest of baseball lows, fans who still believed in the team hoped that one day the Mets would return to the World Series. Father Andrew then compared the optimism and faith of the Mets fans on the train to the Marianist Martyrs who remained faithful through persecution. Even as they were tortured and killed, the Martyrs continued to trust in God to guide them through their struggles and, ultimately, their physical deaths. Father Andrew explained that we must also continue to remain faithful to God, even through times of challenge and struggle. As the students left the AAC, they had renewed faith that God will help guide them through any type of obstacle that they may face in their lives. As long as they put their faith in God, He will guide them to eternal life in Heaven. Posted in News and tagged mass, spirituality. Bookmark the permalink.